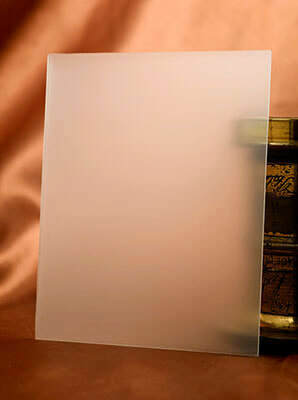 I make brand new premium grade hand ground glass using some very thin and light weight glass stock. This glass is very high quality optical grade and the thinnest I have ever found. Finding this rare glass is the reason I make ground glass. The glass can not be purchased here it comes from Germany. The grind it provides with the low weight is just fantastic. The photo below shows three ground glass. The lower glass is a typical thickness similar to that found at a local glass shop or the standard cheap soda lime type glass. The middle sheet is an original Graflex ground glass from a Graflok back. The top sheet is the glass I am hand grinding. As you can see it is very thin and hence light weight. The edges of the glass are honed and ground not sharp. Since the glass is so thin you may have to shim down your ground glass holding pins to make up the missing space from the typical thicker glasses. (This is not an issue with Graflex Graflok backs the special glass I make for those drops right in.) Obviously this has no effect on focus plane it's in the same place as the thicker glass. To give you an idea of the weight savings of this glass I weighed several 4x5 and 5x7 screens to compare. 4x5 Ground Glass to fit Graflex 4x5 Graflok - $35 shipped to cont usa. 4x5 Ground Glass Super Fine Grind - $35 shipped to cont usa. 5x7 Ground Glass Super Fine Grind - $45 shipped to cont usa. Please provide the exact size glass you need as 4x5 has many variations. I normally keep Graflex Graflok ground glass in stock and it only takes a couple days to get your glass in hand. Thank you for your support! Just a fantastic piece of glass. After trying other gg I'm so pleased! Wish i can put more stars. Seller replied surprisingly fast. Ship fast. Great.